SALT LAKE CITY— The National Cancer Institute (NCI) has awarded Huntsman Cancer Institute (HCI) at the University of Utah its Comprehensive Cancer Center status, the highest designation possible. The announcement was made today in an award letter from NCI to Dr. Mary Beckerle, HCI’s CEO and director. The award was the result of an extensive review process that culminated in a full-day on-site visit by national cancer research experts and thought leaders in the fourth quarter of 2014. 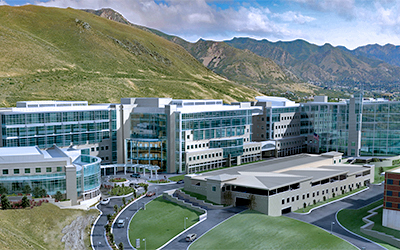 With this new status, Huntsman Cancer Institute joins distinguished cancer centers such as Memorial Sloan- Kettering Cancer Center, MD Anderson Cancer Center, Dana-Farber Cancer Institute of Harvard University, Johns Hopkins Kimmel Comprehensive Cancer Center, and the Mayo Clinic Cancer Center; recognized among the top cancer centers in the world. HCI is the only cancer center to be designated by the National Cancer Institute in the five-state Intermountain West region, which includes Utah, Wyoming, Montana, Idaho, and Nevada, and which covers more than 17 percent of the continental United States landmass. The comprehensive cancer center designation recognizes not only the outstanding cancer research, training, and public outreach programs that have long been conducted at HCI, but acknowledges the exceptional depth and breadth of HCI research in each of the three major cancer research areas: laboratory, clinical and population-based research. The designation also recognizes HCI for the impact of its research findings on national cancer care guidelines and improved patient outcomes. An NCI-Designated Comprehensive Cancer Center must demonstrate depth and breadth of cancer research, as well as substantial transdisciplinary research that bridges these scientific areas and changes cancer care. In addition, a comprehensive cancer center must demonstrate professional and public education and outreach capabilities, including the distribution of clinical and public health advances in the communities it serves. The evaluation was done by a team of national cancer experts, and included a rigorous scientific review, a competitive grant process, and a site visit. In a letter of support at the time the grant was submitted, Utah Gov. Gary Herbert wrote of the “major impact [Huntsman Cancer Institute] has on advancing cancer research, education, and treatment not only in our state but in the nation. NCI evaluates each of its designated cancer centers every five years. Since the previous evaluation in 2009, when HCI applied and obtained renewal of its cancer center status, it has recruited 33 new program members and garnered 20 percent more NCI funding of its studies, even as such funding became more difficult to obtain. HCI opened more than 60 new collaborative grants and doubled enrollment in clinical trials of cancer treatments in the five-year project period. In addition, building expansion completed in 2011 doubled the size of the cancer hospital, and construction is underway that will double the size of HCI’s research facilities upon its completion in 2017. HCI’s research excellence has been made possible by generous support of the Huntsman family and the Huntsman Cancer Foundation, which supports HCI’s research mission through philanthropic contributions. A 10-member External Advisory Board provides planning and evaluation direction to HCI; it includes such outstanding scientific luminaries as Edward Benz MD, president of the Dana-Farber Cancer Institute of Harvard University; Nobel Laureate Elizabeth Blackburn, PhD, of the University of California at San Francisco; and Brian Druker, MD, director of the Oregon Health Sciences University Knight Cancer Center. Now considered a world leader in the study of cancer genetics, Huntsman Cancer Institute’s research strategy is to translate genetic understanding of cancer into individualized risk assessment, diagnosis, and treatment. HCI and its researchers have earned international recognition for their work in identifying gene mutations for hereditary colon cancer, breast and ovarian cancer, melanoma, neurofibromatosis, and paraganglioma. NCI is part of the National Institutes of Health, one of 11 agencies within the Department of Health and Human Services. It was established in 1937 as the federal government’s principal agency for cancer research and training.